There is just something about Ubud that is hard to describe but it is amazing. 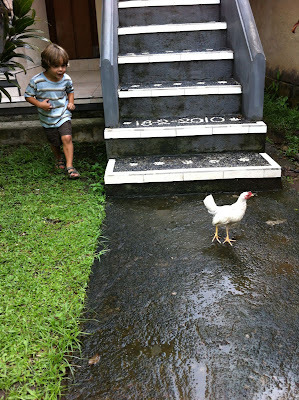 Bali in general is amazing, but Ubud has that something extra special. Maybe it's the feel of the city or the people or the spiritual aura or the uniqueness that surrounds every nook and cranny here. It's hard to pinpoint but it is just amazing. 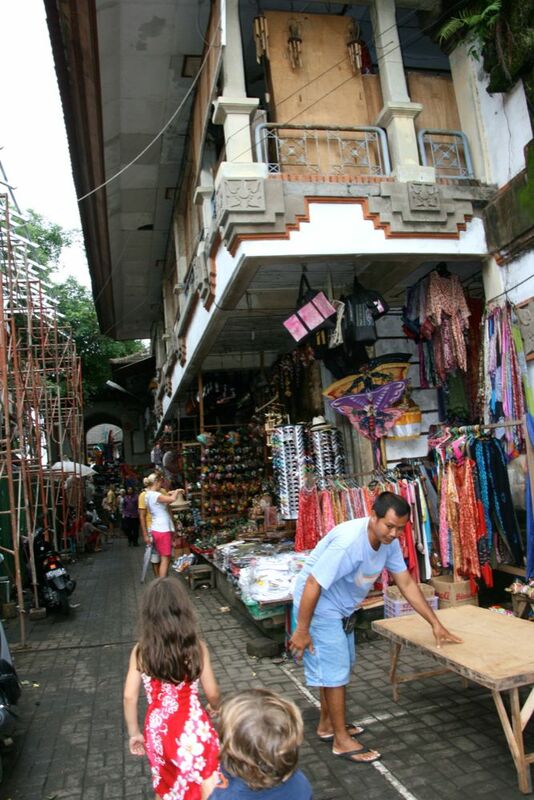 Ubud has a main street that circles the tourist area that is always jam packed with traffic. 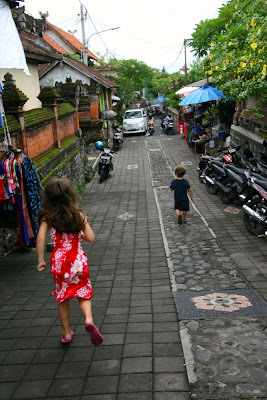 But once you are away from the main road there are lots of little paths to explore and those lead to more little paths and they continue in a well laid our maze throughout Ubud. Roads where only motorbikes and people can go. Each street is uniquely different but still the same Balinese style. It would be a photographers paradise with all the colors that are abound. It is so much fun just walking the street and exploring. The people are so loving and the culture is so accepting. Everywhere we go people are friendly and they love kids. Bargaining is the norm around here which is great most of the time but sometimes it get down right exhausting. And it seems everyone here loves to bargain. There is a aura of calm that surrounds Ubud. When we wake up each morning and have breakfast on our guest house patio calm is in the air. Even while buildings are being built all around Ubud it is still peaceful. One street might take you to a river or another to a rice field with ducks or another to some interesting shopping. The people are incredibly warm and most things are still super cheap! Maybe I am in the "I love Bali so much I only have rose colored glasses on", but even with the people building the house next door I still find this place peaceful. I love yoga but I'm not a yogi. We've met plenty of yogi's here.